In the submission, Apple claims the collective bargaining and attempts to access the iPhone's NFC functionality by the banks "will not achieve any of the public benefits claimed" by the Commonwealth Bank of Australia, National Australia Bank, Westpac Banking Corp, Bendigo, and Adelade Bank. As Apple considers this "cannot satisfy the statutory test," Apple "will not and cannot agree to the terms sought by the banks." The banks want access to the NFC controller to be able to offer their own digital wallet systems, which is claimed in the application to provide competition. Apple doesn't believe this to be the reason, writing in the submission that the banks want NFC access to bypass Apple Pay entirely, avoiding transaction fees in the process. Apple alleges the "increased competition" claim doesn't apply, as if the banks were given NFC access, they could start "specifically charging" customers for using Apple Pay, discouraging the use of the mobile payments platform and thereby reduce competition with their own proprietary wallets." Offering NFC access to the banks also creates significant costs, "including negative effects on consumer security and data privacy," the ability for users to select their payment card at the point of sale, and a depreciated customer experience." The only benefit that would arise from NFC would be to the banks, not the public, Apple suggests. Banks "would be allowed to continue to free-ride on the significant investments made by Apple in its devices, iOS platform and App Store infrastructure," and the technology used to make NFC payments, "without paying any fees for transactions processed via Apple Pay's secure element infrastructure." Apple also accuses the banks of using the ACCC authorization process itself to delay negotiations, with the process taking "some ten months" until the date of "Final Determination." 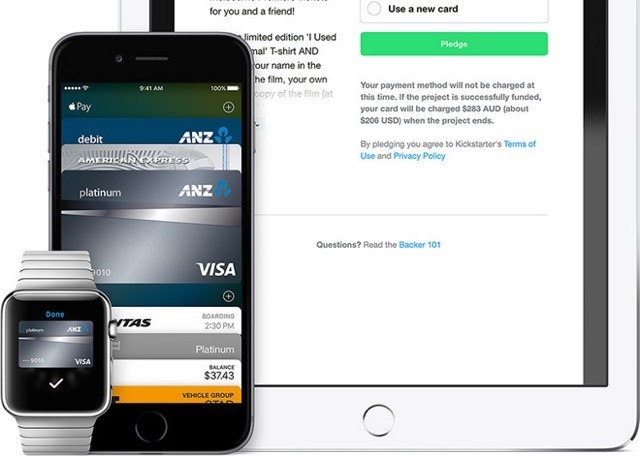 The forced delay is affecting approximately 70 percent of Australian cardholders, namely customers of the negotiating banks, with Apple suggesting the slow expansion also harms "smaller card issuers who already, or could in the future, rely upon Apple Pay" to provide mobile payments to compete against its larger rivals. "The applicants' refusal to engage with Apple during the authorization process provides evidence of the chilling effect of the proposed collective conduct on the benefits of competition through innovation in digital payments offered by over 3,500 banks to millions of consumers in 13 countries." The ACCC's interim ruling suggests that the use of Apple Pay instead of allowing the banks NFC access could in fact increase competition, by "making it easier for consumers to switch between card providers and limiting any 'lock in' effect bank digital wallets may cause." The banks have called Apple's assertions "incorrect and supported," in a statement received by Bloomberg. The Application wasn't about preventing Apple Pay from expanding in Australia or reducing competition, the banks claim, suggesting it as being "about providing real choice and real competition for consumers and facilitating innovation and investment in the digital wallet functionality available to Australians." A formal response to the ACCC's draft determination is expected to be published later this week. A group of Australia's biggest banks have again applied to the Australian Competition and Consumer Commission (ACCC) in a bid to negotiate with Apple over Apple Pay. The banks -- including Bendigo and Adelaide Bank, Commonwealth Bank of Australia, National Australia Bank, and Westpac -- today announced that they have "narrowed" their application with the ACCC to focus on gaining open access to the NFC function integral to Apple Pay. The new application echoes the banks' original, filed last July, which also included gaining access to the NFC-based mobile payments software in iPhones. Apple currently only allows its own mobile payment system to access the NFC-hardware in its iPhone devices, which banks argue is an anti-competitive restriction that hampers consumer choice. The banks say that while Apple has a "stranglehold" on this technology, no actual competition can take place in the mobile wallet marketplace. Open access to the NFC function on iPhone is required to enable real choice and real competition for consumers, and to facilitate innovation and investment in the digital wallets available to Australians. Without open NFC access on iPhone, no genuine competition in the provision of mobile wallets is possible and Apple will have a stranglehold on this strategically important future market. Previously, the coalition of banks also sought to challenge Apple on Apple Pay due to the service's fees. In the new application, the banks decided to eliminate arguments over fees and any other items "the ACCC considered may lead to a public detriment." Prior to the new application, the ACCC had denied the banks' request to negotiate over Apple pay two times last year. “This application has always been about consumer choice, and allowing competition between the makers of mobile wallets to offer the best products and features they can to determine which mobile wallet consumers will use. The applicants want to put up their digital offerings head to head with Apple Pay, and let the market and individual consumers decide which best suits their needs. According to the banks, full access to NFC on iPhone devices "would enable the delivery of substantial public benefits to Australian consumers," across a variety of categories other than mobile payments, including loyalty programs, member security, and other NFC-related cases. Because of these benefits, the banks said they they "have again been supported by nearly all of Australia's leading retailers." Last week, Apple responded to the Australian banks' continued obstruction of Apple Pay by saying it was damaging to consumers and small business alike, ultimately referring to their request for access to NFC as a potentially hazardous "Trojan horse" scenario. In today's applications, the banks referred to Apple's comments as a "conspiracy theory" and dismissed it as "fantasy." According to Blockley, who spoke on behalf of the banks, the NFC-targeted application is not an attempt to delay Apple Pay's wider support in Australia as it would be offered alongside other mobile wallets -- similar to how Android supports open access to the NFC function. "Any delay or frustration will be as a result of Apple refusing to negotiate," Blockley said.